Crescent Sands is a North Myrtle Beach resort that sits right on the white sandy beaches. This North Myrtle Beach resort is in the Crescent Beach section of North Myrtle Beach, South Carolina. 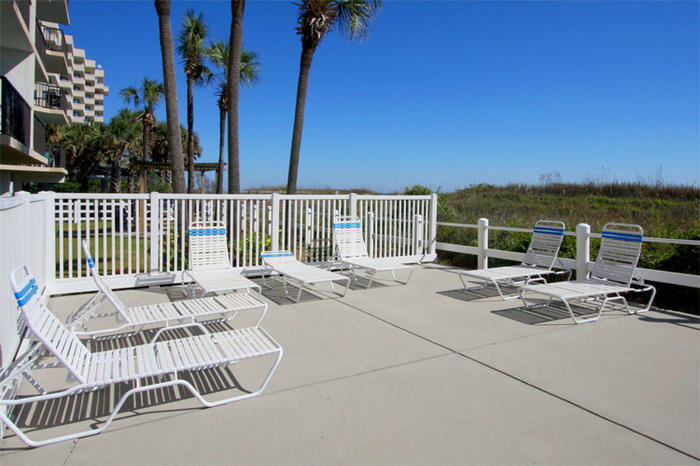 The North Myrtle Beach condominiums at Crescent Sands have private balconies that overlook the oceanfront swimming pool and the beautiful white sandy beaches. Drive into Crescent Sands and easily find a place to park. There is a stairway at both ends of this North Myrtle Beach resort and elevators are located right in the middle. There are only six levels of North Myrtle Beach vacation rentals at Crescent Sands and all of these condos in North Myrtle Beach, SC face the Atlantic Ocean. You will love the views and the easy beach access from these North Myrtle Beach rentals. This North Myrtle Beach resort is near all the terrific amusements and attractions found throughout North Myrtle Beach and Myrtle Beach, South Carolina. There are golf courses up and down the beach and miniature golf courses are on nearly every corner. Your family is going to appreciate the central location of this North Myrtle Beach resort because you can get from one terrific activity to the next amazing attraction in no time. And when you are enjoying a North Myrtle Beach vacation you do not want to spend time in the car driving all over. You want to play, swim and relax. Crescent Sands is a North Myrtle Beach vacation choice that you will not regret. The North Myrtle Beach condominiums at Crescent Sands are so much larger than a typical hotel room. These condos in North Myrtle Beach, SC feature far more amenities and personality than simple hotel rooms, too. How about a three-bedroom North Myrtle Beach vacation rental with enough sleeping accommodations for up to eight people? There are three full baths in this North Myrtle Beach condominium rental so it really is designed and furnished for your utmost comfort. The décor and ambiance in these North Myrtle Beach vacation rentals is inviting and will make everyone in your family feel right at home. The kitchen of these condos in North Myrtle Beach, SC has full-size appliances. It is so convenient to have a refrigerator in which you keep your soft drinks and juice nice and cold. The dishwasher helps in the clean up after you make breakfast for the kids or a picnic for the beachfront. Elliott Beach Rentals is not affiliated with onsite management or the HOA of Crescent Sands.